You name it we can move it! Are you looking for someone who can safely and efficiently transport heavy equipment for you? Look no further than Jets Towing Inc. We are a one stop shop for all your towing needs. We specialize in machinery removals & machine transport in NYC. Our fleet of heavy and medium duty tow trucks and flatbeds ensure that we can effectively deliver heavy machinery and equipment right across town or even for longer distances. Machinery transport requires experienced and trained staff, as well as the latest machinery with when it comes to the tow truck. Our specialized trucks undertake this work and are fully equipped with lifting gear. We have all the required equipment for a smooth and seamless machinery transportation and relocation. Our tow truck operators and drivers have years of experience loading and lugging heavy loads of all types, including heavy machinery. Using the latest tow trucks machinery and equipment and best in class vehicles, we guarantee our customers quality and efficiency when we transport machines or equipment to the destination of their choice at always competitive rates. Entrusting the transport of valuable machinery to the experts at Jets Towing will allow you to enjoy absolute peace of mind. Our experienced drivers ensure that your machinery is in good hands, and taken care of along the journey. 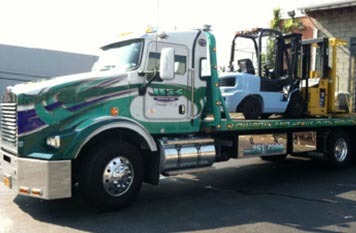 Jets Towing strives to be a reliable and ethical company providing top-notch machine transport services in NYC. If you need some help for machine transport service in NYC, choose Jets Towing to handle the job for you, you won’t be disappointed! Copyright 2019. Jets Towing Inc. All rights reserved.